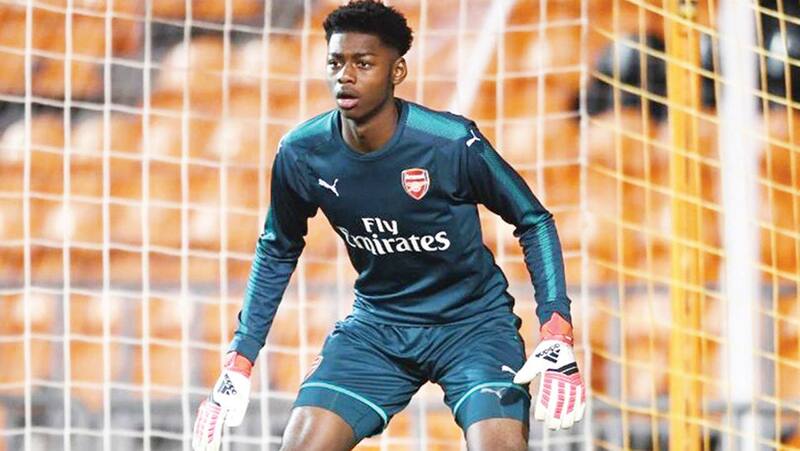 Arthur Okonkwo and Arsenal have not agreed on a new contract for the 16-year-old goalkeeper.PHOTO: MIRROR.CO.UK. Arthur Okonkwo, 16, is being targeted by RB Leipzig and Celtic because he has yet to sign a deal at Arsenal. The England U-17 international is still eligible to play for Nigeria if the Super Eagles got him before he earned a full international cap for the Three Lions. Okonkwo, who is already 6ft 5in, is seen as one of Arsenal’s most promising youngsters with a genuine chance of making the first team and is regarded highly in the England set-up. Okonkwo is keen to stay at Arsenal but the club’s purge on contracts means they stand to lose him as he can walk away as a free agent in the summer.Arsenal have offered him a scholarship with a professional contract to follow when he turns 17 in September but no agreement has been reached. That has alerted several clubs who are offering better deals with Arsenal in danger of losing players because of their attitude to contracts.Arsenal brought in Huss Fahmy, formerly of Team Sky, to negotiate contracts and he is quickly getting a reputation of being a tough operator at all levels. They have asked Jack Wilshere to take a pay cut at first team level and move to a pay-as-you-play deal but Arsenal are clearly taking a similar attitude throughout the ranks. Wilshere can walk away as a free agent this summer when his contract expires.in.Okonkwo has already trained with the first team and is seen as one of the club’s future gems who could be pushing to be in the senior squad within the next two years.But this stand-off means that Okonkwo may be forced to look elsewhere even though he is not interested in signing for another Premier League club.